When Mackenzie Miller first encountered Mandarin Chinese during high school, she was quickly drawn into and captivated by a language so different from her own. During her college search, Miller knew study of the language was not something she was ready to leave behind, and even though Hesston College doesn’t offer classes in Mandarin, she chose to start at Hesston because of the freedom, flexibility and support the college could offer her as she continued pursuing her passion. Now Miller, who graduated from Hesston in May 2018, finds herself halfway through a year-long stay in Nanjing, China, having an immersive cultural and linguistic experience with Hesston’s bridge year pilot program. Early in her final semester at Hesston, Miller was considering options for the following fall – transfer somewhere to study communication or take a gap year. Then President Joseph Manickam requested a meeting with her. In the early months of my final semester at Hesston College, I sat down to lunch with President Joseph Manickam, or Joe as we call him. And in a noisy cafeteria, over loaded baked potatoes, he said this: “God loves you, Mackenzie, and Joe has a plan for your life.” I had an inkling from the minute he had asked to meet with me. It was China. He wanted me to go to China, or at least that’s what I hoped he would ask me. And he did. Part of Manickam’s vision for Hesston College is, as he puts it, “for every student to have a passport.” Hesston has long maintained a strong international student program on campus – averaging an annual international student population of about 13 percent. International students live outside of their norm and comfort zone every day, and Manickam wants all students to have the same opportunities for experiences and growth in new cultures. During 2017-18, Manickam’s first year as president, the college began exploring a bridge year program that would provide global and career-based experiences in new contexts. Miller is the inaugural participant. To organize and facilitate Miller’s experience in Nanjing, Hesston College worked with Mennonite Partners in China, a China-based organization that provides opportunities for North Americans to experience and build relationships with the Chinese people and culture. The program for Miller includes language study at Nanjing Normal University and serving in an internship with Zhi-Mian Institute, a psychology center. Every weekday morning, Miller studies Mandarin with other international students. They work on character writing and having conversations with one another. In the afternoon, she works at her internship. She lives in international student housing with two Malaysian roommates. On weekends and during free time, she explores the city of eight million and the surrounding region, taking in the culture and history. As organizers at the college hear about Miller’s experiences, they are continuing to format the program to be of the most benefit to students, and are finding that a combination of language and cultural experiences hold a lot of value. Individual experiences like Miller’s are only one way transcultural study is offered at Hesston. The college also offers shorter group experiences as well. This summer, three-week or month-long group trips are being planned to Japan, Thailand and Philadelphia, which are open to students and others with interest. Miller still has about six months left in her program, and is looking forward to the continued growth and learning she will glean from her experience before returning to the U.S. and preparing to attend sister institution Goshen (Ind.) College in the fall. Understanding the challenges and rewards that come with transcultural rewards, she’s excited about the global impact Hesston students will have on their communities and professional lives as a result of the opportunities they have before them. 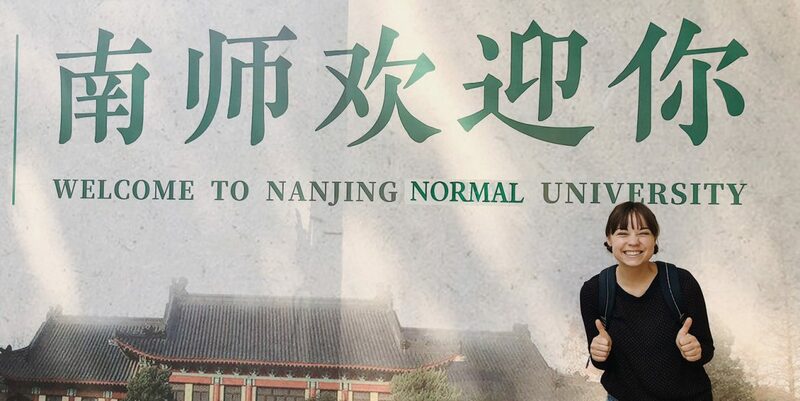 Follow Mackenzie Miller on her transcultural journey in Nanjing, China.